Having a video strategy is important, everybody knows you need one, but how? There are lots of options; freelancers, agencies, in-house help… they all make great videos but what is the difference? A marketeer knows they need lots of up to date video content but you don’t want to spend a fortune initially as your management team need to be wowed by the first video and measure impact before a formal budget can be assigned. So a collection of videos is produced by an external production agency and everybody is very pleased with the results. As the content is used more and more across the company, both management and the content marketing team embrace the format and produce more and more content for training, promotion and events. Video is becoming a standard part of the marketing mix and the company sees more and more revenue from the marketing budget being spent on video production. They all agree they need to realise a more cost effective solution for the longer term so they decide to recruit a full time video producer who sits within the digital marketing team or the content team. This approach works well for a few months but they quickly realise they can’t output the same volume of content to the same standard as the agency, as their manpower was much greater. A compromise is made that all social content and smaller more consumable content will be produced in house but for bigger productions they will go back to harness the skills of the agency. We have seen this many times with our clients and hear of similar stories from other producers. Outsourcing is generally the most expensive route but opens up a host of different skills and talent under one roof. Kit: Agencies recycle their profits back into the best production kit to keep them ahead of the competition. No ongoing costs: On costs are a huge extra that needs to be taken into consideration when using in-house staff. Thinking outside the box: An agency will be working with multiple clients at the same time constantly having to come up with creative ideas and solutions to marketing problems. A good agency is always busy, which is a good sign but it could affect the speed of delivery of your project. In a fast paced work place with lots of restructuring agency staff might be out of the loop with key contacts and hierarchies when it comes to planning a production. Outsourcing is a quick way of testing video as a way of delivering content without the investment or training needed in-house. The best agencies will walk you through the production process and help you to deliver your story in the best way. 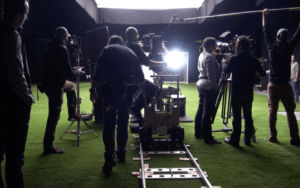 Another reason to choose an agency is when you’re looking for a specialist service for example motion graphics, aerial video which requires specialist equipment and talent. There is another option, Do it yourself! If you know you have a constant need for content that doesn’t have to be particularly high-end then in-house could be the way forward. Knowledge of the wider team and internal structure. When approaching a corporate video project a large part of the pre-production process is organizing people. If your staff already know people and their roles this is one less laye oor of administration. Efficiency – For a set investment (the persons salary) you can make any number of videos rather than being charged per video with an agency. Investment: You’ll need to invest heavily into equipment, Lighting, audio recording, cameras, edit suite, computers with high specification. On costs: There are lots of extra costs to consider: Pension contributions, office space, holiday pay. Long term investment: Not only will you have your employees overheads, but equipment needs to be upgraded regularly to compete with your competition and to stay compatible with the latest software. In-house works well for businesses who have tested the water and are creating consistent content over long periods of time. In-house is great for productions that don’t need the highest production values e.g. disposable social content or internal comms. These are a world apart from the other end of the spectrum such as broadcast ads or product videos. In summary, there are points for and against both in-house and outsourcing your video production depending on where you are in your journey and how much budget you have available. The key takeaway is that you don’t have to do one or the other. Our experience of working with corporate, education and public sector clients has seen a mix of the two work really well to deliver great content.